It’s hard to tell if I’ve heard of all of Buster Keaton’s greatest films and this isn’t one of them but silent film fans know it, or if I’ve barely scratched the surface of silent film. Either way, I only found out about this in doing costume research for a play about a silent film set. It’s hard to know what to expect. The General was a very straightforward narrative with emphasized physical humor. On the other hand, Sherlock, Jr (and indeed most silent film comedies I’ve seen) meandered to wherever the jokes might be. In addition, Sherlock, Jr is very much a movie about movies (Keaton’s character has a literal dream of jumping into a Sherlock Holmes movie), so I’m not sure where this can go that parts of Sherlock, Jr didn’t. 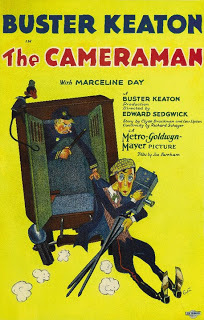 Apparently, Keaton’s character gets a job as a cameraman to be close to his love interest. That still doesn’t tell me much about what to expect, since that’s probably just an excuse to get the story to the gag theme. A photographer struggling to make a living selling tin-types happens to get pressed into Sally as a ticker-tape parade passes, and is instantly smitten. He gets her to agree to let him make a tin-type of her, but she gets bundled into her car before he’s finished processing it. He tracks her down to the office of MGM Newsreels, and decides to get a job as a newsreel cameraman to be close to her. The boss rejects him out of hand, but Sally urges him to join the other cameramen to try to get good shots to sell. His first reel is laughably bad, but Sally encourages him to keep trying, and she might call him on Sunday if something happens to her “sort-of date”. Most of this movie follows the structure I’ve seen before. Plucky underdog hero meets girl, girl is charmed by guy and helps him out, but isn’t sure if she wants to go with him because she doesn’t know how much of a jerk her boyfriend is, physical comedy ensues. But of course, the story isn’t the point, but the comedy routines. The gags were funny, usually of the type I as a jaded modern viewer was chuckling at before they were even fully set up. Some of the sequences as a whole I may not have seen coming, but usually that was because they were such far digressions from the ostensible subject matter. Keaton forced to share a tiny public pool locker room changing cubicle with a large man was a surprise, because what is that doing in a story about a film journalist trying to date a secretary? That doesn’t make it any less funny, but it’s odd. However, later on there’s a sequence where Buster goes to a Chinatown parade where a gang war suddenly breaks out, and as the only cameraman on the scene, he gets some hilariously good shots by accident and mischief (at one point he stops filming two men wrestling on the ground to hand one of them a knife so it looks more exciting). It’s the only time I was actually laughing out loud, maybe because I have camera experience myself. I got less of the end than I should have been able to, because I’m so used to modern movies with extended denouments and epilogues and 20-minute credit rolls. Here, even though I could see the seeds of it earlier, I was a bit worried about how happy the end could be with less than five minutes in the entire movie to turn the hero’s defeat around. I know especially in this genre, the happy ending was a last-minute loose end tying to bookend the jokes, but I was still shocked at how late they let it go. Watch this movie: for an actual, unironic banana peel slip. Don’t watch this movie: expecting it to live up to… whatever the most recent great physical comedy is. Come to think of it, when was slapstick last done brilliantly?